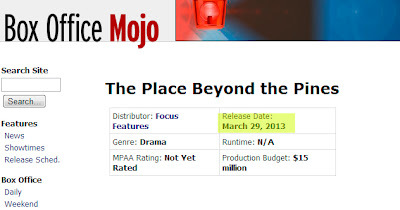 According to Box Office Mojo The Place Beyond The Pines "is now scheduled for limited release in March"
Updated: Collider.com have commented on the earlier than expected release date for 'The Place Beyond the Pines' expressing surprise that the movie would be released so early. After positive reviews and generating awards buzz at the Toronto Film Festival commentaters expected an awards season release sometime in the fall..
"The Toronto Film Festival is widely considered to be the place where a majority of the buzz for so-called “awards films” begins, and this year one of the biggest surprises was Derek Cianfrance’s (Blue Valentine) crime drama The Place Beyond the Pines. 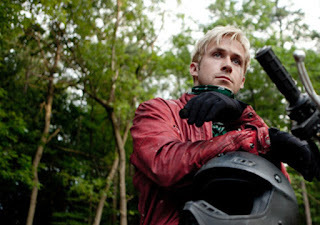 The pic stars Ryan Gosling and Bradley Cooper and centers on the intense feud between a professional motorcycle rider turned bank robber (Gosling) and a rookie police officer (Cooper). The film premiered to an enthusiastically positive response at TIFF, with heavy praise given to the film’s scope and impact; our own Matt Goldberg called it an “epic family saga” in his positive review." Great news! ... or maybe not such great news as we first thought?